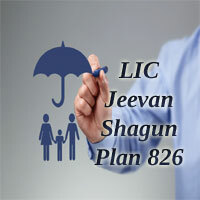 LIC’s Jeevan Shagun is a single premium Money Back Plan. The LIC Jeevan Shagun Policy introduced on 01st September 2014 which will be open for sale for a maximum period of 90 days. LIC Jeevan Shagun Plan is a Non-Linked Participating Plan, which provides the Life Assured to opt for the Maturity Sum Assured. During the term of the policy, high-level death cover like Jeevan Saral is provided. The Unique Identification Number is 512N290V01. Based on the age of the Life Assured and Chosen amount of Maturity Sum Assured, the premium payable is decided by the Corporation. The Premium and Maturity Amount can be calculated using the LIC Jeevan Shagun Premium and Maturity Calculator. The LIC provides the Liquidity needs of the Policyholder through Loan. At the time of Maturity and at the end of specified durations, the Maturity Sum Assured along with Loyalty Addition is payable to the Policyholder. LIC Jeevan Shagun is a single premium Non-linked Savings Plan. On Survival of the Life Assured until the end of the Policy Term, 65% of Sum Assured along with Loyalty Additions are provided. At the end of the 10th policy year, 15% of Maturity Sum Assured is paid the Policyholder. On Survival of the Proposer, 20% of the Maturity Sum Assured is paid at the end of the 11th policy year. If the Life Insured dies within the Policy Tenure (after 5 policy years), the Sum Assured along with Loyalty Additions would be paid to the nominee. Minimum Maturity Sum Assured Rs 60,000/-. Maximum Maturity Sum Assured No Limit. The Maturity Sum Assured should be in multiples of Rs 5000/-. Premium Payment Mode Single Premium. Proposal Form 300 or 340. The Benefits that are available in this LIC Plan 826 are available below. They are. On Death during the first five policy years: The Nominee will receive the Basic Sum Assured, which is 10 times the Tabular Single Premium. On death during the policy term after completion of five policy years: Along with the Basic Sum Assured Loyalty Addition is provided. Maturity Benefit: If the Policyholder survives till the end of the Policy Term, 65% of Maturity Sum Assured along with Loyalty Addition is payable. Survival Benefit: On Survival of the Life Assured until the end of specified durations, the survival benefit as mentioned below are payable. They are. At the end of the 10th policy year, 15% of Maturity Sum Assured is payable. At the end of the 11th policy year, 20% of Maturity Sum Assured is payable. Loyalty Addition: Depending on the Corporation experience, the LIC Jeevan Shagun Plan is eligible for a share of profits in the form of Loyalty Addition. It is provided for Maturity, Death or Surrender of the Policy. The Rebates under this LIC’s Jeevan Shagun Plan are listed below. They are. Rs 1,50,000/- to 3,95,000/- Rs 15/-. Rs 4,00,000/- and above Rs 20/-. The Policy that is completed under the Corporation Employees Insurance Scheme is eligible for CEIS Rebate. A Rebate of 2% on tabular premium is provided if the policy is not taken through any agent or broker. The Life Assured worries about the calculation of Premium amount that has to be paid for Policy Purchasing. The LIC Jeevan Shagun Premium Calculator is used to calculate the Premium to be paid by the Policyholder. The Amount of Single Premium Paid will depend on the Sum Assured , Policy Term and Age of the Life Assured. The Maturity Amount can also be calculated by using the LIC Jeevan Shagun Maturity Calculator. You need to enter Some Basic Information like Name, Mail Id, Mobile Number, Age, Policy Term, and Minimum Sum Assured to calculate the Premium Value. The Customer can buy the Policy in three different ways. The easy method for purchasing the policy is through Online Mode. The Policy can be bought online by filling the necessary details like PAN details, Occupation, Medical History, Existing Life Insurance Plans, etc. The Other way to purchase the policy is through LIC Agent or Visiting the nearest LIC Branch Office. The necessary documents to buy the LIC Jeevan Shagun Policy are listed below. The Nominee can apply for claim, if sudden death occurs to the Life Assured. The Claim can be made by the Policyholder after the completion of the Policy Term. Maturity or Death Benefit is provided along with the Sum Assured at the time of claim process. The Life Assured/Nominee should carry the following documents for the claim amount. The Claim Form is available at the official website of LIC or at the Life Insurance Corporation Branch Office. Surrender Value: During the Policy Term, the Policy can be surrendered at any time subject to realization of the premium cheque. For First Year: 70% of the single premium paid excluding taxes and extra premium. For Remaining Years: 90% of the single premium paid excluding taxes, survival benefits, extra premium. Special Surrender Value: The SSV is the discounted value of the Maturity Sum Assured less Survival Benefit. Loan Facility: The Life Assured can avail the Loan Facility after the completion of One Policy year. Taxes: Taxes including Service Tax, as per the tax laws and rate of tax applicable from time to time. Suicide Clause: If the Life Assured commits suicide within 12 months from the date of commencement of risk, the policy will be closed. The Corporation will pay only 90% of the single premium paid excluding taxes and extra premium paid. Free Look Period: The Life Assured can return the LIC’s Jeevan Shagun Plan within 15 days, if not satisfied with the Terms and Conditions of the Policy. Back Dating Interest: The Policy can be dated back to the same financial year with rate fixed by the Corporation from time to time. Reinsurance: As per the Reinsurance Treaty, the normal procedure for reinsurance is applicable. Nominations/Assignments: At the time of Proposal Stage, Nomination should be made in the Policy. The Nominee should be Children, Spouse or Close relative of the Policyholder. What is the maximum loan that can be granted for different Policy Years? Ans. The Policyholder can use the Loan Facility after completion of one policy year. For Different Policy years, the percentage of Surrender Value is provided as below. The Rate of interest charges on Loan granted varies from time to time by the Life Insurance Corporation. 2. Is there is any Free Look Period for the Policy? Ans. Yes, a free look period of 15 days is provided to the Life Assured, if not satisfies with the Terms and Conditions of the Policy. 3. What are the Proposal Forms required for Policy Purchasing? Ans. Proposal Forms No 300 or 340 can be used to buy the LIC’s Jeevan Shagun Plan. 4. What are the rebates in this Jeevan Shagun Policy? Ans. The Rebates under this Plan are CEIS Rebate, High Maturity Sum Assured Rebate.